Once again, Aldo has provided me with a sartorial dilemma…I have mentioned here how confused I am by some of their styles (delightfully wacky and fashion forward or straight up busted?). Well, it’s happened again! Now, besides the fact that I could never wear these shoes because of pathetically weak ankles, I don’t know! The print is sort of crazy BUT I feel could work with a super simple outfit, maybe a simple white dress or some high-waisted shorts and a tee. But maybe they are just eye searingly awful? Please, tell me because I really don’t know. You can snag a pair of these Forwood Wedge Heels at Aldo for $90. While you’re there make sure to check out the Medium Green ones, which are much easier on the eyes. I think the shoes are super adorable! I can totally see them looking awesome with the outfits you described. For me the real question is: if you have $90 to spend on shoes, do you spend it on shoes that are versatile or outfit-specific? So yes, the shoes are amazing, but not practical for a lady with a budget. This is crazy. I spent 5 months in West Africa working with a local tailor on ways to market western style shiz made with West African wax-stamped Pagne fabrics (which is what this is). We talked about bags, skirts, laptop covers, quilts, aprons, but never did I EVER think I’d see a pair of platform heels made out of a pagne. I remember our friend Katie Hunt-Morr and I having the same conversation about African fabrics in fashion a couple of years ago! We talked about working with a tailor to make prototypes but never did anything. 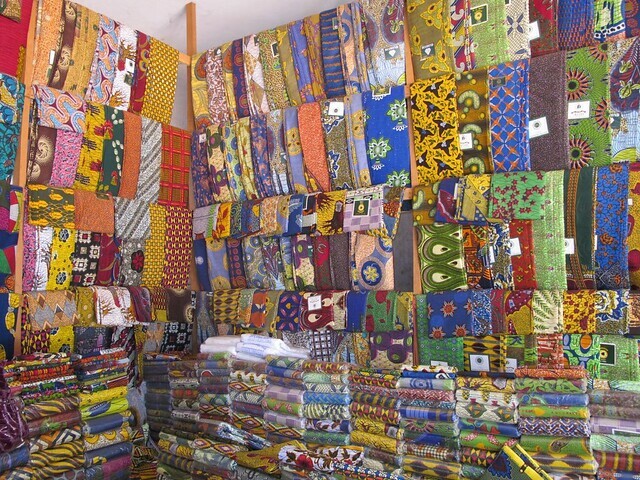 She had all this awesome fabric from Tanzania. CUTE! But only worth getting if they’re not too pricey. I would say, a cute pair of cropped, skinny black pants with a white top would be the perfect thing to wear with these platforms. I saw these recently and thought the same thing. $90 for shoes that I might have to take off in an hour? BUT I really love the print and am really into all the printed shoes out there (florals yay!) I think they can spruce up a simple outfit without much thought.